I met Jacinto “Hoss” Mendoza about 6 years ago in Salinas, CA. 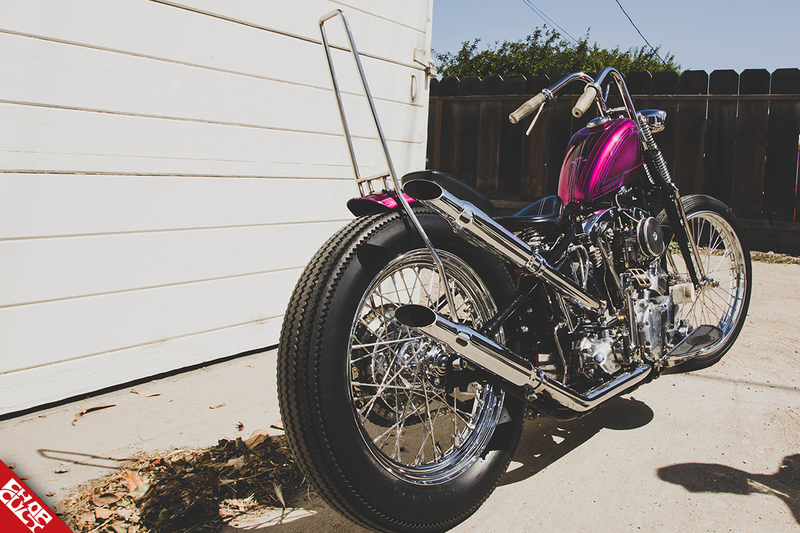 He’s built a few beautiful bikes in his little shop behind his house in the old company town of Spreckels, CA. Hoss currently spends the majority of his time running his industrial refrigeration company with his brother. 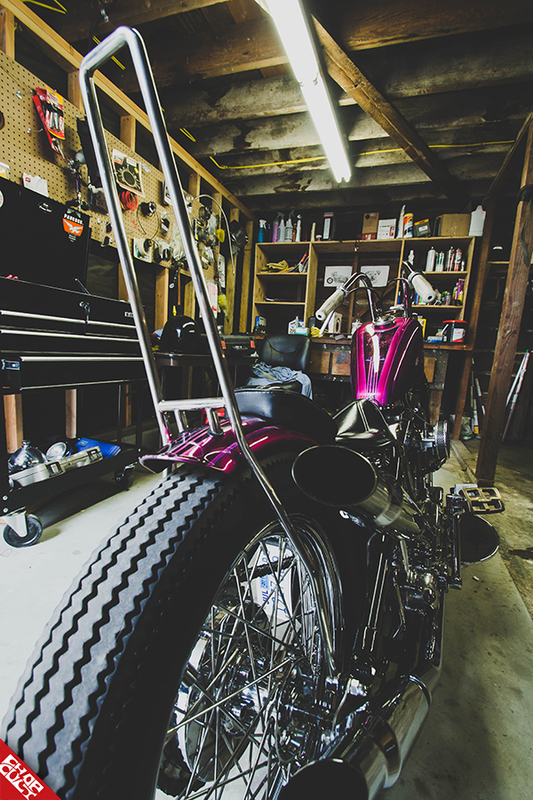 When time permits, he tinkers with bikes in his shop. I love having a few beers with him and listening to his stories about the early 90’s lowrider scene in Salinas. This bike reflects that era. I will let him tell the story of this bike in his own words. 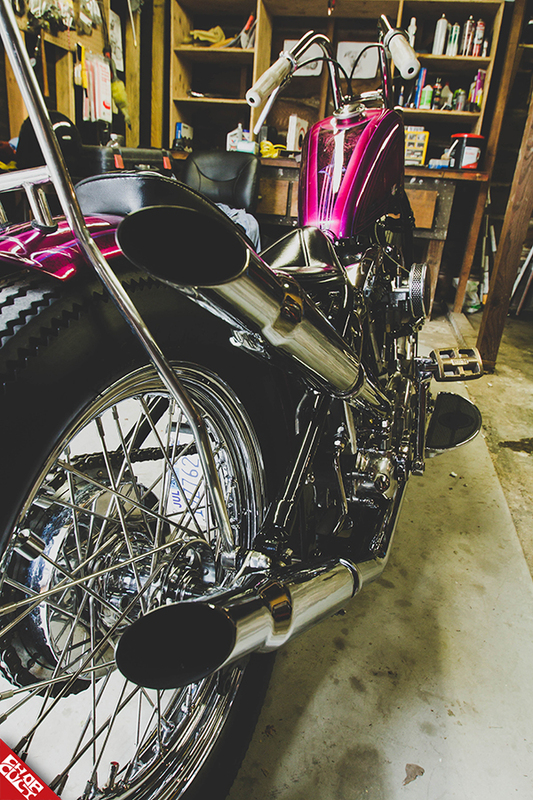 “I originally got this bike a couple years back in a completely different state. I knew I wanted to change the overall style of the build when I got the bike. I also wanted to build the bike back up from my influences of the early 90’s lowrider scene. Back in those days, Salinas was really on top of the lowrider car world. 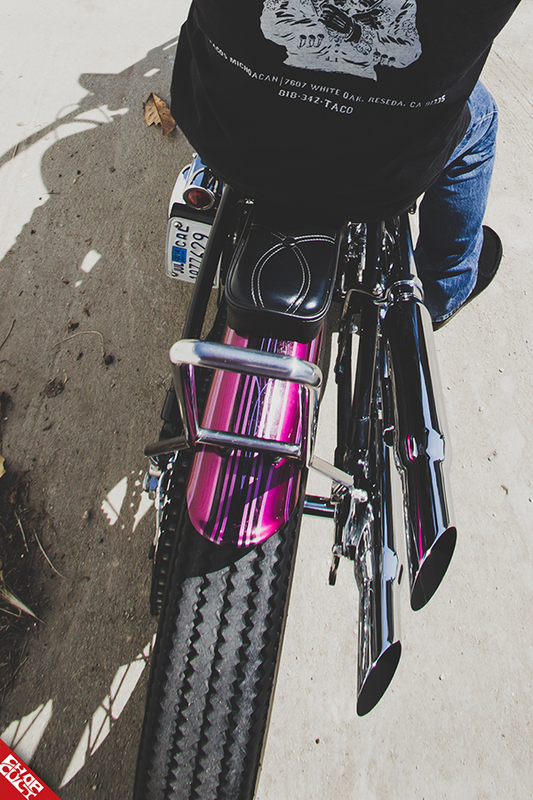 A lowrider from Salinas, Loco ’64, pretty much dominated the lowrider scene back then. That’s where these stories connect. I met a dude named Rudy Puga in ’94 and he was involved in doing some of the paintwork on Loco ’64. The car was mainly painted by the one and only, Rod Powell, but Rod had stopped painting at that time. So Rudy helped finish painting as the car kept getting more mods done to it. Rudy painted a choptop Caddy I had way back then. I loved the color of my old car, so I decided I wanted to use the same painter and theme for my bike. Nowadays, Rudy is a boxing promoter so painting was the last thing on his mind, or so I thought. I hadn’t seen him in 15 years and didn’t even know if he lived in the same place. 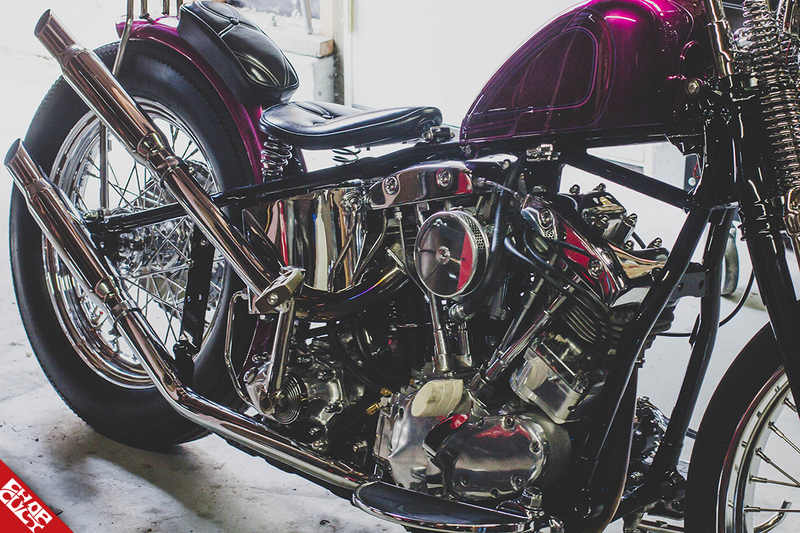 I stopped by Rudy’s pad and he was more than excited to see me, especially since I had a sportster gas tank and skinny little rear fender that I had prepped for paint in my arms. He still called me “Chinto”, a name people stopped using for me years ago. 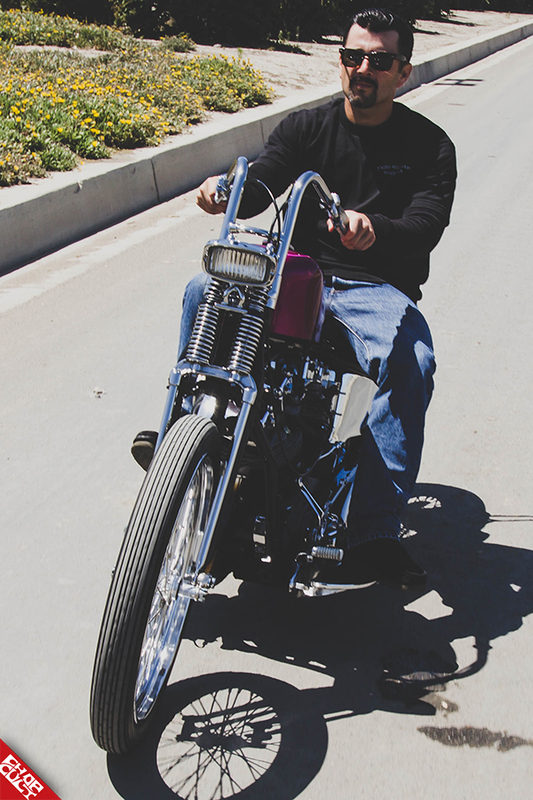 I truly believe our relationship was the reason I got involved in custom car and bike culture. After the tins were painted, I came across a Mullins Chain Drive narrowed springer that Jasin of Phares Cycle Parts had posted for sale. It was bare metal so it needed to be powdercoated and chromed. I used a Crow's Nest from Cro Customs to build a set of pullbacks. I brazed all the joints, then had it all chromed in San Jose, CA. For the front headlight, I used an old square KD light my cousin gave, and made a light bracket which took me two weeks to braze and sand out. 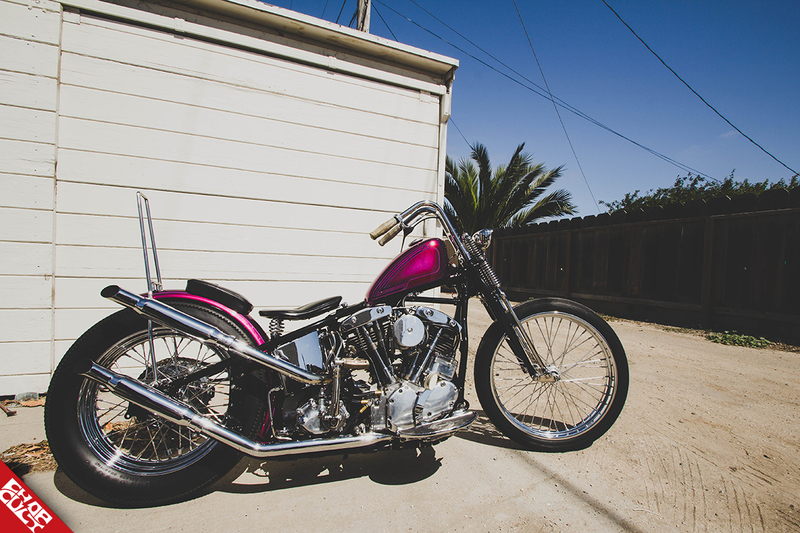 I made a squared-off stainless sissy bar before I prepped the fender and tank. 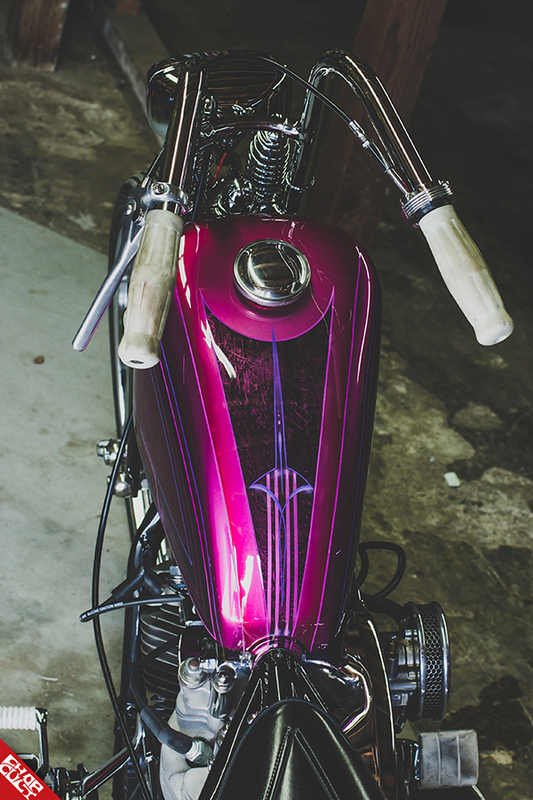 The engine is a genny Shovel with Delkron cases, 81” barrels and rebuilt heads. I ended up using a new Joe Hunt Magneto and S&S Super E carb. Engine, year and make, model, modifications: 1966 Pan-Shovel, Delkron cases 80 c.i. barrels, S&S Super E carb. Frame: 1952 Harley Wishbone, stock. 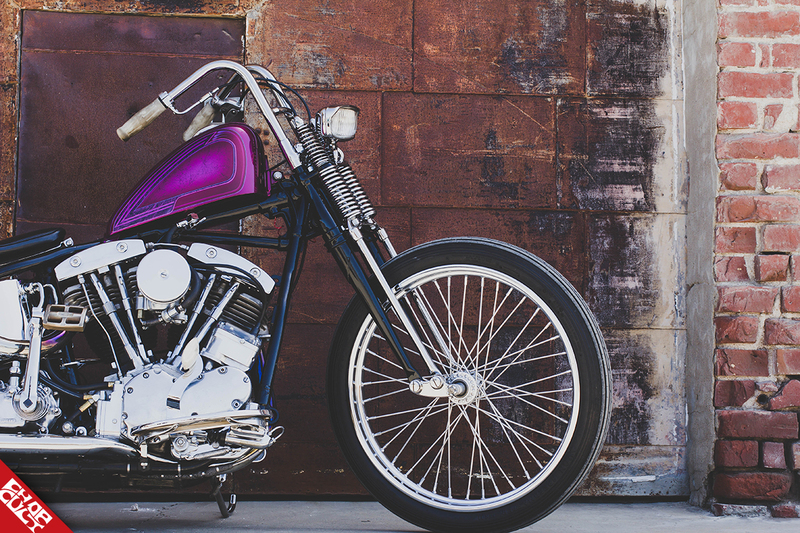 Fork: Harley OEM Knucklehead Narrowed by Mullins Chain Drive. Tire/wheel size and style: Front:21" x 2.15” Rim with a mini spool hub. Rear:18" x 3.5" with a star hub and drum brake. Favorite thing about this bike: The paint is my favorite thing because it was painted by an old friend of mine who isn't painting anymore. Next modification will be: The bike already looks a lot different now! Other mods, accessories, cool parts, etc: I made a lot of the parts on the bike: Bars, sissy, and everything else needed to put it together. Any building or riding stories or info you'd like to include: First bike build for me and it was a fun experience. I never realized how much of your character and personality goes into a bike. Article and photographs by Andrew Quinones / @drew.quinones. So killer. Love the paint. Beautiful, absolutely beautiful. It does remind me of that era. Congrats Mr. Mendoza on a job well done. can we see some left cheek too? Nice bike. I agree with ACXL1K, need to see the other side also! !